Comment #15, Kim Yi Dionne! It's hard to come up with anything to say about Nina Munk's magnificent new book that hasn't already been said. The Idealist: Jeffrey Sachs and the Quest to End Poverty takes as its task trying to understand Sachs and his Millennium Villages Project (MVP). Munk, who had a high level of access to Sachs and his staff for about six years, details the MVP as the realities of development, culture, and community preferences slam up against Sachs' expertise and view that the solutions to global poverty are primarily technical. Others have written about how Munk beautifully portrays Sachs' hubris in the face of overwhelming evidence that some of his ideas are not working, pushback from experts and local leaders, and signals of distress from MVP field staff. This will no doubt be very satisfactory to Sachs' most stringent critics, who have long puzzled over why he was initially so resistant to having the MVP rigorously evaluated using the gold standard of impact evaluation methods, randomized control trials. Munk's narrative is damning on these and many other accounts. It is an absolute must-read for anyone who is interested in doing good for those in need. Far from writing a cheerleader's account about someone who "just wants to help," Munk raises questions about whether poverty actually has technical solutions, or whether cultural norms and behaviors can derail even the most well-funded and planned activities. For example, Sachs' purpose-built livestock market in the Dertu, Kenya MVP now sits mostly unused. The reason? Somali-Kenyans living in the area don't want to sell their livestock in Dertu. Camels and goats are a sign of a family's wealth and serve as a kind of savings account for difficult times. In ordinary times, nobody wants to sell those animals - it would be like an American selling off her house to cash in on equity when he or she has no reason to want to move. Technical solutions to the problems of poverty are all the rage in the era of randomized control trials and other well-designed studies of the impacts (or lack thereof) of particular interventions. There are good reasons for this; we need to have evidence as to whether some interventions work, and when we have such evidence, we can direct resources so they have the maximum impact to improve people's lives. But RCTs and other rigorous impact evaluations often lack a key element in their research designs: understanding the why's and how's behind program success or failure. The lack of contextual understanding is particularly important in understanding why interventions fail. For example, the excellent Tuungane I evaluation by a group of Columbia University scholars led by Macartan Humphreys showed clearly that an International Rescue Committee program on community-level reconstruction did not change participant behaviors. The study was as well designed as an RCT can be, and its conclusions are very convincing. But as the authors note, we don't actually know why the intervention failed. To find that out, we need the kind of thick descriptive qualitative data that only a mixed methods study can provide. (Full disclosure: I'll be leading an evaluation of a later phase of the Tuungane project to learn if anything has changed. More on that later.) A well-designed RCT makes it easier to ask those questions by providing clues and bases for hypothesizing on what went wrong. I suspect that if Sachs had been willing to submit to rigorous, independent evaluation from the beginning of the MVPs, we might have a basis on which to test questions about why and how the MVP interventions succeeded and failed. As it is, we don't have that data. But Nina Munk has done a great service in her detailed description of the process by which the MVPs and Sachs got to where they are today. While I'm not hopeful that this will actually happen, an honest, independent evaluation of the project's failures might be the best thing that could happen for the MVPs and the field of development studies. What do you think? Have you read Munk's book? I have a free copy of Nina Munk's The Idealist to give away. If you'd like a chance to win, please leave a comment below. 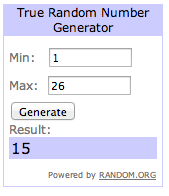 I'll use a random number generator to choose a winner. Comments will close at 5pm EST on Thursday, November 7. Please note that I can only ship the book to addresses in the US and Canada - deepest apologies to those of you living further afield.